With the final of X-Factor scheduled for 15th December we are inching ever closer to finding out who will be crowed champion of X-Factor 2013. X-Factor is celebrating 10 years and to celebrate, this weekend is the Best of X-Factor – just as well there are only six contestants left!. Before the contestants commenced their performances, Olly Murs made a special appearance and reminisced about his time on the X-Factor. He must have forgotten that was only 4 years ago. And he did Xtra Factor too until last year! Nicholas McDonald was up first. He gave us Joe McElderry’s “The Climb”. Looking at Joe’s subsequent success as a recording artist Nicholas must be hoping for better. It was his birthday too and he was given a great big cake by Dermot. At 17 he is not much older than X-Factor. With Sam Callahan gone the bookies had Hannah Barrett as this weekend’s most likely to leave. She has been in the bottom two twice so she had to pull out all the stops. She sang “Hallelujah” from Alexandra Burke. She was given great praise from the Judges. Her days were sure to be numbered then. Luke Friend, recovering from his bottom two place gave a unique performance of “What Makes you Beautiful” from one of the most commercially successful acts in a decade of X-Factor . He certainly made it his own and was given glowing praise by the Judges – another one who, despite the positive reception may have his days numbered. For some reason positive praise doesn’t always convert into votes. Rough Copy, the only remaining group, were up next with “Don’t Let Go” – sung by X-Factor winners Little Mix in 2011. Sharon didn’t like the song but the reaction was otherwise good for them. Tamera Foster was up next. She forgot her words last week. 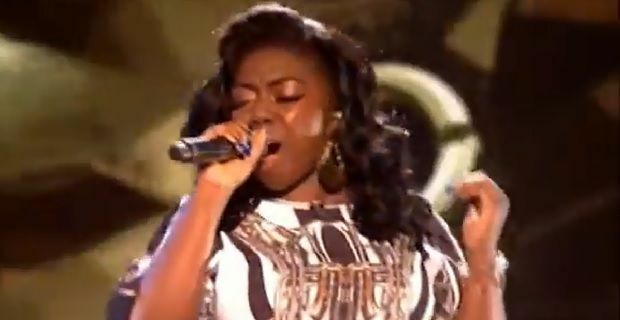 She had "Impossible" from last year’s winner James Arthur this week. She went and did the Impossible and forgot her words again. She must have some memory issues – maybe her new haircut affected her brain but it was, as Gary Barlow commented, like a car crash. Closing Saturday night’s show was favourite Sam Bailey. She gave another power ballad in the form of “Bleeding Love”performed on X-Factor in 2006 by winner Leona Lewis. Once voting lines closed it was time to reveal who was in the bottom two. Luke, Nicolas and Sam were through leaving Rough Copy, Hannah Barrett and Tamera Foster. When Tamera was revealed as the act going through there were audible boos from the studio audience who, quite rightly, felt aggrieved that two good acts were facing elimination as Tamera, who can’t even remember her song lyrics each week was through. But that was the result of the public vote and Hannah was up first singing “I’d rather go blind” followed by a performance of “Don’t Go Crying your Heart Out” by Rough Copy. With Nicole and Gary saving their own acts it was down to Sharon and Louise. Sharon choose Hannah, really only because it was her third time in the bottom two. Louis, with an option to go to Deadlock, decided to also choose to send Hannah home. With Hannah now gone it’s now getting very tense and the final five are back on next week’s X-Factor at 8pm Saturday on ITV1. They will have to sing two songs – one chosen by the public - can Tamera cope with that amount of lyrics? The results will be revealed Sunday at 8pm ITV1.